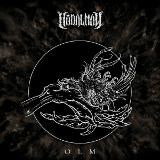 Australian technical death metal outfit Hadal Maw's latest, Olm, has an interesting take on its genre that differs from the average. Olm's guitars are the most noticable portion at first, but the drumming's wide variety and the backbone of its sound, an off-kilter riot of groovy tech death that is a solid improvement from the last go-around. Gone are the days of sludgy murkiness; the tone is sharp and technical, filled with crushing groove bends punctuated by wild but perfectly executed lead fills. There's a tension to both guitar and bass, fueled by the chugging reverb, and Rob Brens' oddly-timed beats, compressed to a tight, dull thud, perfectly complement the twittering wail of the solos. New vocalist Sam Dillon is a good choice for the band's new direction; his delivery provides a suitably agonized foreground to the grinding chords, never letting the listener off with slack or clean vocals. Grinding or not, Olm's also capable of effortless delicacy, such as on Germinate, in which the fret-tapping solos and groovy chord changes stop for a minute or two to let the lead guitar wail a high, thin minor-key solo, the sort that was popular on thrash metal albums of the 80s. The mix of old and new -- mostly new -- is a compelling one, and even for those who prefer a less modern rendition of technical death metal, Olm's smooth confidence is catching.